By Linda W. Perkins on	 July 27, 2018 Do You Know? 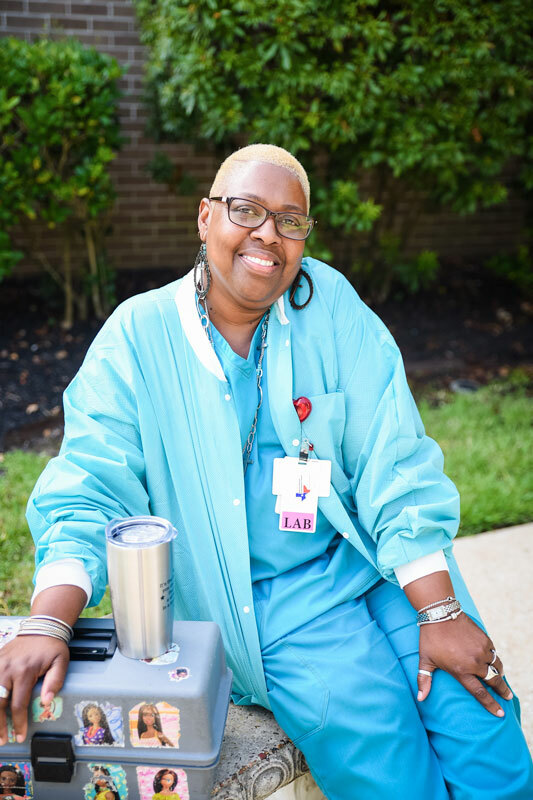 If you’ve ever had your blood drawn at Huntsville Memorial Hospital, there is a good chance you’ve met Josephine James, otherwise known around town as “the singing phlebotomist.” Originally from New Waverly, she is a proud mother and grandmother, known for singing everywhere she goes, from the kitchen to Brookshire Brothers. More than that, however, she has created a personal ministry inside her place of employment for over 25 years, touching hospital patients and staff alike with her musical message of hope and joy in the Lord. How long have you been singing, and what type of music do you sing? I’ve been singing all my life, I think as long as I’ve been talking. My daddy was a singer, and I heard music all my life. People laugh at me because, even though I sing a lot of gospel, I’m a country girl. I love country music. That’s what I grew up around. At the hospital, I mostly sing gospel, but if someone asks me to sing a country song, I will, because I’m flexible. I want to do whatever will make them feel better. Tell me about your career with the hospital. I’ve been with Huntsville Memorial since 1991. I started off at the back of the kitchen, went to the cafeteria, and then ended up in the lab in 1996. I’ve been in the lab ever since, as a phlebotomist. I knew that’s what I wanted to be when I walked through the doors. How long have you been singing to patients, and what’s been the response? Ever since I walked into the hospital, I’ve been singing to patients. When I was delivering trays, I was singing. But when I became a phlebotomist, I got to sing a little bit more to them, because it’s a more hands-on experience. I can actually turn and look at them. I want to try to make their trip here pleasant, so if I see they’re not looking right – because you never know what a patient is going through, what condition they came in, what news they got from the doctor – I’ll start humming. Then if they don’t tell me to be quiet, I’ll sing something for them. They usually cry and hold my hand, and they tell me thank you and bless you for singing that song…and they’ll usually ask me to come back! What songs do you usually sing to patients? I wake up every day with a song on my heart. That’s the song of the day for me. When I open my eyes, I say thank you Jesus for letting me see another day, then whatever song comes out of my mouth, that’s what I’m going to sing the rest of the day. My daddy asked me, “What you do you want to be?” I told him I wanted to be a singer. He was okay with that. He was a singer in a gospel group. He taught me how to sing on command. He did a great job teaching me. It’s just that I have to be able to feel that song whenever I’m singing. I always sing songs I feel from my heart. If that song touches my heart, then I hope and pray it will touch someone else’s. How does your singing help your job as a phlebotomist? Most of the patients don’t like what I do with my hands, my work as a phlebotomist. They’ll tell me to leave my cords and needles in the hall, but to come in and sing for them! I think it (the singing) helps them relax. Most of the patients I sing to are the cancer patients who get tired of getting stuck with needles, and I understand that. They’ll let me sing to them. As a matter of fact, if I’m not in the lab, they will request me and wait for me. Some of them will even call before they come so I’ll be ready for them. Has the hospital been okay with you singing? Has anyone ever asked you to stop singing? I sing so much that I’m usually singing when I go in the room, and forget to ask if it’s okay. But if I’m humming something or singing something and it’s getting on their nerves, I respect them and I’ll stop, because maybe that’s not the moment for them to hear that. That’s what’s in my heart and that’s what I want to share with them, but I will give them their space. I won’t sing in their rooms. It’s their room, and I respect that. But in the hallways and in the elevator—that’s my studio! I can sing freely out there! Can you really be that happy to be singing all of the time? There was one patient that remembered me from years before who went and asked the people at registration if they could get me to stop singing. She told them, “Every time I see her, she’s singing. There’s nobody that can ever be that happy all the time!” Which is right, because some of the time I’m not happy. Sometimes I don’t feel good. I sing to make myself feel better, too. Not everyone wakes up happy or feeling good every day. But when I wake up and start singing, I know that somewhere in my day, I’m going to be happy. I’m going to stop and just raise my hands, because I’m feeling it. I’m feeling the fire (of the Holy Spirit) all up inside me. That’s what makes me feel good. That’s how I know He’s real. He doesn’t come just when I want Him to. He comes right when I need Him. That’s the thing about what I do. Someone will tell me that I’m ministering to people through my music. My response is that I want people to know where I’m at in my life, and I want to make people feel good around me. Somewhere along the day, I’m going to get happy, and if I can’t get happy, then I’m going to make others around me happy until I can get there myself. You don’t just sing at the hospital, but at funerals, too. How are the two connected? Every once in a while, I will walk in a room singing and someone will request a song. And people remember me years down the line. That’s what’s so neat about it. They’ll call up to the hospital and ask to speak to me, or ask me to sing at their loved one’s funeral. Most of the patients will usually ask me themselves (about singing at their funerals), though. I’ll write down what song they want, and I’ll sing it for them. I’ll ask them, “Are you sure this is what you want? Do you want me to put your name in the song?” And most of them will say, “Josephine, I know you’ll do a good job, so just do whatever you’re going to do with the song. I want my loved ones to have a good day on my day going home.” So I sing for them here at the hospital, and some of them I get to sing for their loved ones at the church house. That’s what makes my life complete. I mean, that patient and I had a connection and grew as friends. Now they want their family members to meet me also, for them to see how their trip in the hospital was, when they were living and I was there. I sang to them and I eased their pain for just a little while, even if just for a few minutes, and we connected. Have you ever had someone actually come to know the Lord as a result of your singing? I feel like it has happened. I had a patient who said they weren’t really religious and they didn’t feel that way about the Lord until they met me. I went to singing, and they saw all the joy coming from me—how happy I get and how my expressions changed and I’m a totally different person—and they requested that I come in. That lady took my hand and thanked me. She said, “Josephine, I thank you because now I see. I’m going to investigate for my own that He’s actually real. The joy you gave me, you touched my heart, so I want to know more about Him.” That let me know that someone is listening, not just myself! Huntsville Superstar is coming up. Have you ever thought about competing in it? No, I just do what my daddy told me when I told him I wanted to be a singer. He said, “Girl, you’re too old to be running up and down the road competing with everyone. You just keep doing what you’ve been called to do.” Everyone around here and in New Waverly, where I grew up, knows I sing. I’ve even gone to churches and when they find out I’m coming, they’ll ask me to sing. I have a CD that Sam Houston Funeral Home let me record at their studio, and I’ve heard myself on the radio before, and that was very exciting. Everyone is telling me I am ministering through my music, and I feel like I am, because I am comfortable with it. I love doing it. It makes me happy. It makes me very happy.